If you get me on the phone, and you ask if I got your e-mail, which you shouldn’t, but if you do, and I say, “I don’t see it here,” then I’d like you to know a few things. First, I’m not lying. When someone reaches me and asks me that question, I check. Second, I also believe that you sent it. It’d be a dumb thing to fib about. Deleted. And already forgotten. Sorry. Journos get lots and lots of email pitches. We delete out of hand the ones that don’t look right for us, or anyone else we work with. When you call and I can’t find your email, it means that it was one of the messages to not make the first cut. I don’t know how you should respond to this. You could try to pitch me on the phone. Most people do, and 99% of the time, I begin to vaguely remember the email. And why I deleted it. Awkward. Or you could just save everyone a bunch of time and say, “I’ll re-send it,” and ring off. And not call back about it. Don’t start a phone pitch with a geeky tech journalist by going on and on about the Super Bowl. I’m not saying that no tech journos are football fans, but the chances are significant that the person you’re pitching is not. From my office I can see three writers who see the Super Bowl as a great opportunity to go for a nice hike on a popular trail, since everyone else is indoors. Or better yet, hit the CostCo. And if we were really sports nuts, we’d be writing for ESPN, wouldn’t we? Tip #188: What did I just say about focus? I heard from [[CEO]] that he is free any time after 12 noon on Friday. He probably will be driving from Boston to NYC, so if you will let me know a time, I’ll have him call you on his cell. Sorry, I lost you there. Ha ha, AT&T, right? I should move to Verizon. Just a second… lost you again. Ok, I’m back. Where were we? Oh, right. No, I did not hang up on you. I’m on an iPhone and you called my Google Voice number. What did you expect? If you email me a pitch, include your phone number in the message. If you don’t want to put a phone number on your email, put it on your Web site. If you don’t put a phone number on your Web site or your email, I guess you don’t want to talk to the press. 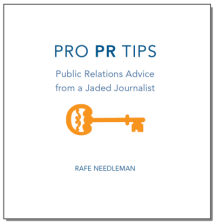 If you don’t want to talk to the press, what are you doing in the PR business? Your call is very unimportant to us. I can forgive you for saying that I’m a freelance writer in your phone message to me. I have been at times in my career. But, “I understand you freelance for Byte,” is beyond amateur. I last wrote for Byte (when I was editor-in-chief — that’s different from a freelancer) in 1996. Cision can’t be that wrong. Byte isn’t even published anymore! 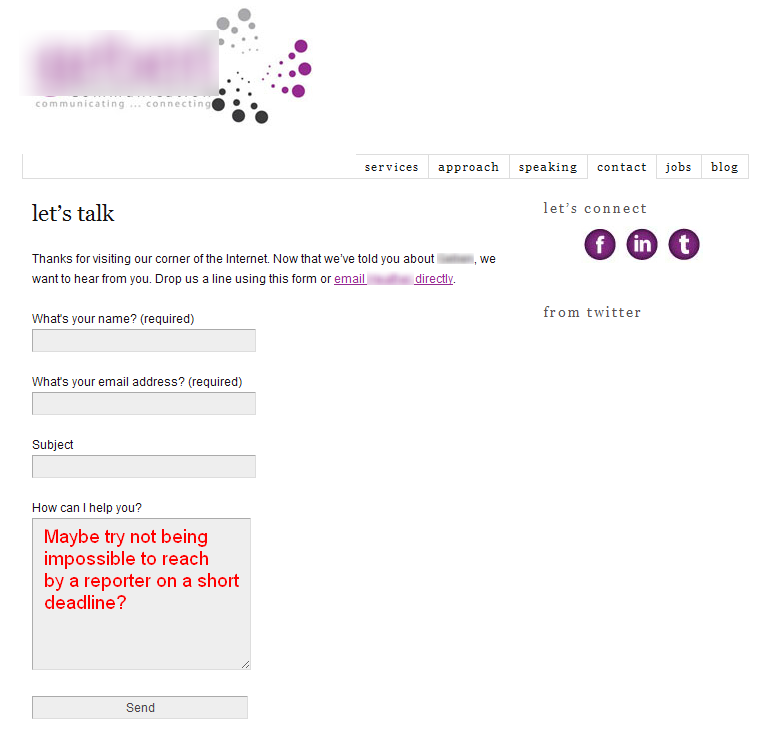 I hope you know your clients better than your PR targets. This is really frighteningly accurate, with one exception. No journo would hang out on the phone this long explaining to the flack why they were turning down the pitch. Video by Steve O’Hear of Last100.com. Hat tip to Bill Baker.